Wealthy businessmen and royal bureaucrats in the Banner of Galactic Peace often find themselves in the position of entertaining prestigious members of similar castes. While most of these encounters occur in mountain palaces and beachside resorts, occasionally these meetings take place in the deep reaches of space. The purpose of such remote gatherings is ostensibly to afford a high degree of privacy, but it is well-known that somewhat illicit affairs occur during these exchanges. Telepro originally conceived of the Staryacht line of light frigates to facilitate just such get-togethers. After unveiling its initial prototype in 3150, the company released seventeen models of Staryachts, more or less annually, to the fanfare of its niche clientele. The aquatic-landing capability of the Staryacht only added to the ship’s appeal to the wealthy. Because the ship’s original design included smuggling compartment options, sensor scramblers, and an encrypted internal communications network, decommissioned Staryachts often found themselves in the hands of pirates and smugglers. A number of suppliers have even capitalized on the illegitimate uses of Staryachts and currently provide a multitude of aftermarket upgrade and modification options. For years, Telepro denied that its engineering intent was to create a production line of “discreet commerce” vessels, but mounting evidence forced them to pull the design after the seventeenth iteration. The Rosebud is one of the final production models of Staryachts, meaning it benefits from nearly two decades of iterative improvements. Under the command of Captain Sara Falconer, the ship has been upgraded with various aftermarket kits, making it a serious threat to current-production military vessels, despite its original commission date fifteen years earlier. 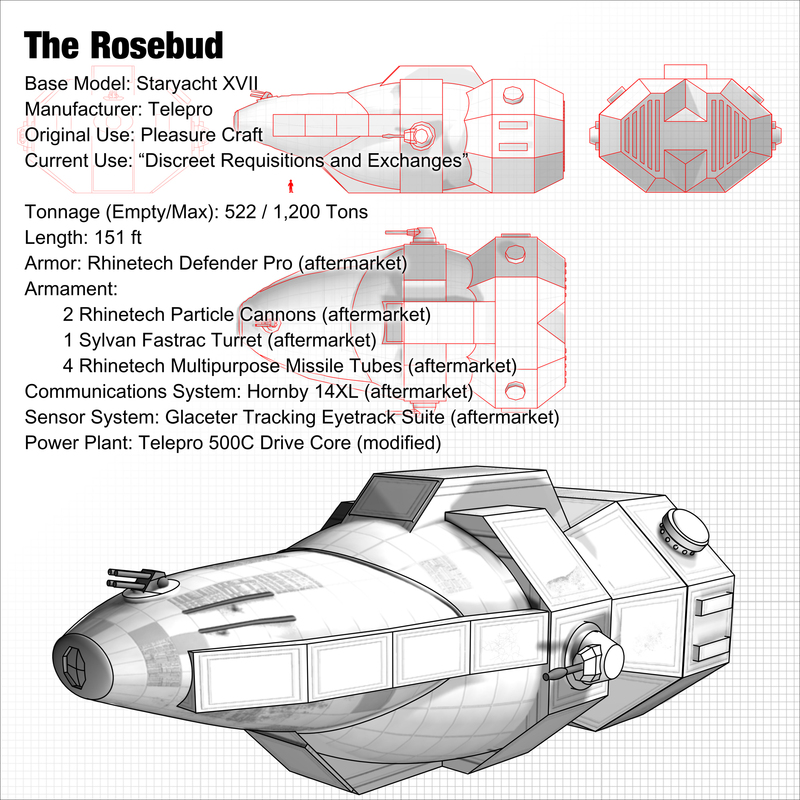 Using Rhinetech’s cutting-edge Defender Pro armor package, the Rosebud’s armor plating can sustain nearly six times the punishment of a standard Staryacht with minimal performance loss. While Defender Pro plates require more maintenance than the standard Telepro fare (mainly due to weakened atmospheric resistance), Captain Falconer has considered the tradeoff well worth the trouble. In addition to increased survivability, the Staryacht’s standard point defense turret has been replaced with a nose mounted Sylvan Fastrac Turret, increasing the ship’s capability against drone swarms and fighters. The Fastrac targeting computer also allows near-instantaneous ballistic calculations, allowing the weapon to function as a poor-man’s missile deterrent. In terms of missiles, the Rosebud also sports two aft-mounted missile arrays each capable of targeting four different targets simultaneously. The munitions are also modular, allowing the Rosebud crew to switch out missile payloads after a mere half hour of changeover time. 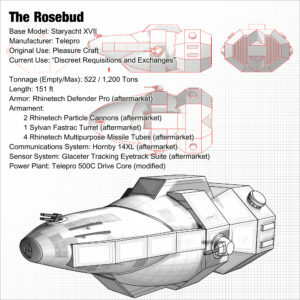 As impressive as the Fastrac and missile arrays are, the primary weapon system on the Rosebud is its dual Particle Cannons. While an opponent ship’s maneuverability typically limits their use to extreme short range, the weapons are devastating against lightly armored targets and can cripple subsystems on larger ships. Its 500C Drive Core power plant has seen a handful of refits, allowing it to compete with current-gen vessels. These tweaks can’t be classified as kits, since they’re almost all custom made by the ship’s engineer, a dwarf named David Baehr. Lastly, some of the Rosebud’s originally extravagant amenities have been stripped for practicality, but each crew room still hosts a queen size bed, an individual bathroom, and a wide screen holomon. The Ship also boasts a full bar and kitchen with its own microbrewery. The lower-deck hot tubs and upper viewing lounges have been stripped to make room for a fully-stocked engineering workstation and an additional cargo bay, respectively.